Displaying collections that are in unusual formats is always an interesting challenge, but worth it when providing access to rarely seen items. 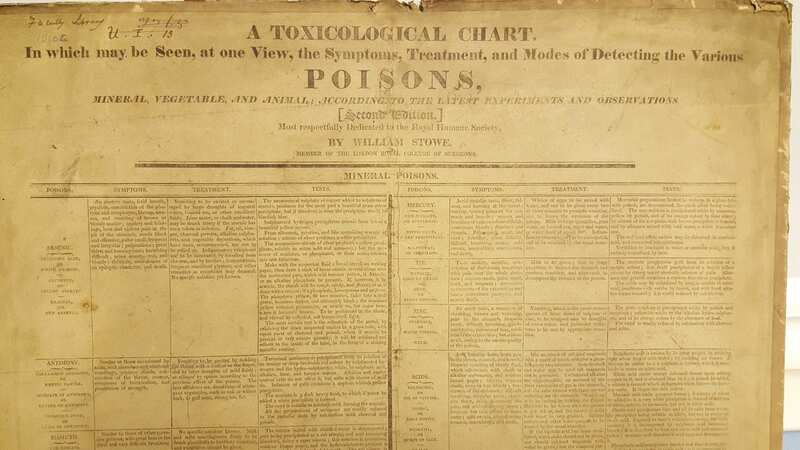 Our latest challenge is with our copy of William Stowe’s A Toxicological Chart. 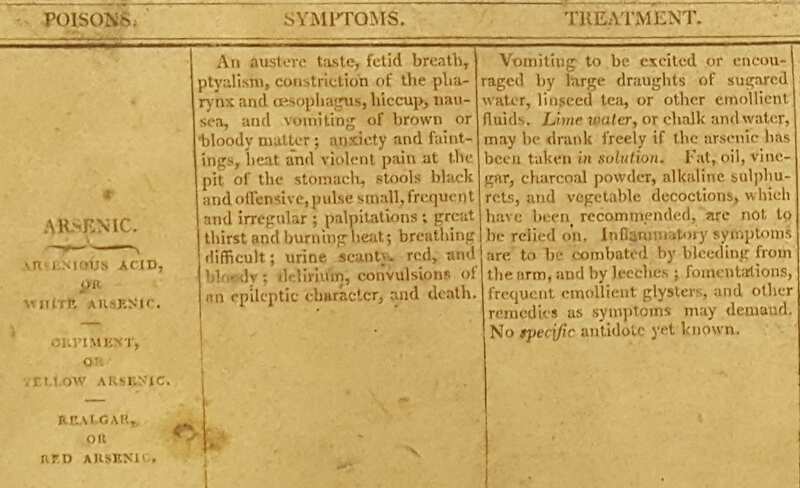 In which may be seen, at one view, the symptoms, treatment, and modes of detecting the various poisons, mineral, vegetable, and animal, according to the latest experiments and observations (c1820). The chart was printed on two separate large sheets for medical booksellers, including Adam Black of Edinburgh. The 2nd edition appears in a list of new publications in The European Magazine and London Review of 1820, stating: “The second edition, with additions and improvements, on two large sheets, broad folio, 1s. 6d or neatly mounted on a board, 2s. 6d.” Our copy is neatly mounted on a board! The chart includes the common poisons of the time, for example arsenic, antimony, bismuth and mercury, as well as poisonous fish and narcotic plants. Symptoms, treatment and tests are laid out for easy reference. Most treatments involved induced vomiting and purgatives, and some mention bleeding and leeches. For antimony, strong tea was recommended, among other treatments. Stowe’s chart was reprinted many times throughout the 19th century. Today, toxicology charts remain an essential resource for medical students, clinicians and for A&E departments. In addition to charts, toxicology databases and apps are now available for quick reference. We hope to display this wonderful item in the Library Reading Room in the New Year.